Kids in the Kitchen was a band from Melbourne, Australia that enjoyed considerable local success during the 1980s. The band stood squarely within the New Romantic movement that dominated mid-1980s pop, showing influences of "New-Rom" groups such as Ultravox in its use of synthesisers, its angst-ridden lyrics, and the tendency of frontman Scott Carne to pronounce words such as "too" and "do" as if these had two syllables. The band's debut single, "Change In Mood", (produced by Ricky Fataar and Tim Kramer) reached No. 10 on the Australian national charts in November 1983. A second single, "Bitter Desire", hit No. 17 in May 1984, after which Dorman and Woodhead quit the band and were replaced by Claude Carranza (guitar) and Alistair Coia (keyboards). 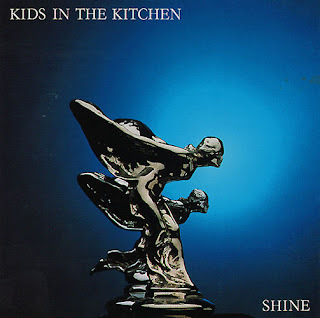 The first single released under the new line-up was "Something That You Said", another Top 20 hit in May 1985, and this was followed by a belated debut album, Shine, which was a big seller nationally and topped the Melbourne charts. Although the title track only reached No. 40 when lifted as a single, the next single release, "Current Stand", became the band's signature song and was a hit overseas as well as peaking at No. 12 in Australia. Carne joined as guest vocalist with The Incredible Penguins in 1985, for a cover of "Happy Xmas (War Is Over)", a charity project for research on Fairy penguins, which peaked at #10 on the Australian Kent Music Report in December. A second LP, Terrain, was released in 1987 with several accompanying singles, but the band could not repeat the success of their debut. They broke up the following year. Following the split, Carne formed a band called Priscilla's Nightmare, who released one self-titled album, then he embarked on a solo career. Carne's solo single "All I Wanna Do" was a minor hit in 1990. Curnow opened a Billy Hyde music store in Shepparton, Victoria in 2002. Harnath owns Hothouse Studios in St Kilda, Melbourne.